Personality: He is a friendly to everyone but only trusts people who he think have deserved his respect. He is also very cleaver and plans his missions completely before doing them. He is also very secretive and it is obvious that he has special plans because of that some reapers are thinking he might be planning something big, this is one of the reasons he is kept under watch.He shows no mercy to people who stands in his way. He is also one of the younger reapers, and because of that he is very interested in other races. He doesn’t mind breaking the laws and because of that most reapers don’t like him. Bio: Grimm is one of the youngest reapers, he became a reaper not long ago. Because of that he still remembered his days as a human and the way he died. During his days as a human, he lived in a small village in Asyl. He lived there as a orphan together with a half-orc who he would later give his life for. They were good friends. But other people didn’t like it when they got close only saying bad things about grimm his friend because he had orc blood inside him. During their teen years things got worse because his friend was a half-orc he left the orphanage, to become a mercenary one of the only jobs his kind could get. When they mercenary group came back it was without his old friend. When grimm asked where his friend was they just said they didn’t know any half-orcs and walked away. Grimm ran as fast as he could to the woods. After a searching for almost the whole day he found his friend. But it was too late his friend was already dying, when Grimm asked who did it. His friend told him the mercenaries got paid to end his life by one of the people in the village they didn’t want him around. Grimm almost lost his mind in his rage and planned to destroy the village, but his friend stopped him knowing that Grimm had magical abilities but he couldn’t control them at all. He calmed Grimm down by telling that death was just another part of life and that all things will come to a end one day. When he was done speaking he died in Grimm’s arms never knowing what would happen to Grimm. A mercenary had noticed that Grimm went into the woods and followed him. 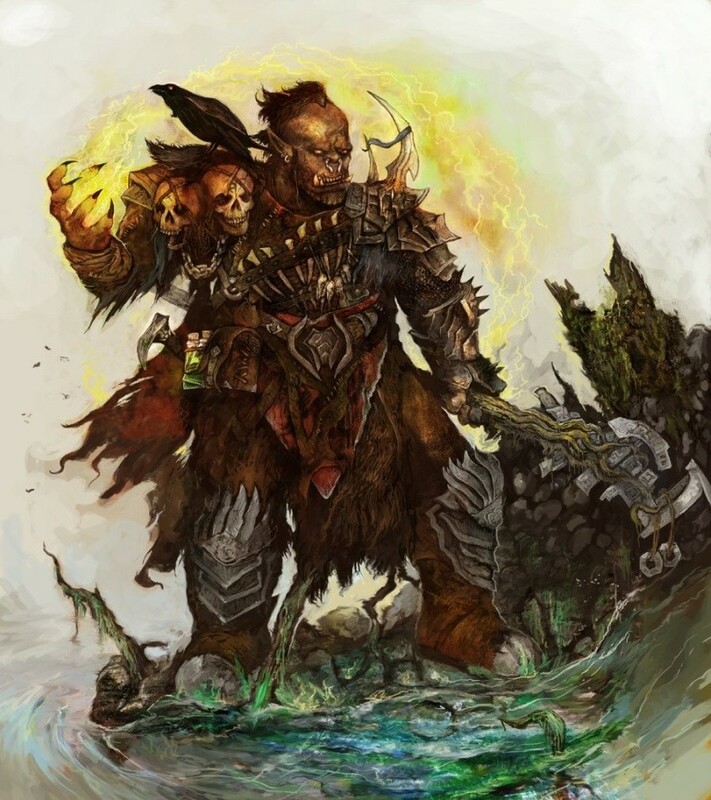 He stayed in the shadows and waited till the half-orc had died, Grimm was crying so he didn’t notice that the mercenary came from behind, until it was too late. He was stabbed through his chest, when his eyes opened again there was a man in a black cloak sitting next to him. He explained to Grimm that he was a reaper and that he had came for the soul of his friend but because Grimm his time hadn’t yet come to reaper gave him a choice. Go the afterlife with his friend, or become a reaper and serve death. Grimm chose the latter and took on the name of Grimm, a name he remembered from the stories in the orphanage.